A passion for food and fine fragrance seems to be a common combination in a lot of people, be it fumeheads, perfumers, foodies or chefs. I don’t think I can honestly count myself to belong into any of these categories (definitely not the first two) but I like a good meal and I have cooked a few decent ones. If you expect a review of a few top NYC restaurants you might just as well skip this post and read something more interesting, because I don’t like fancy, hip or chic. As I said, I enjoy a good meal and thus this NYC trip was meant to (re)visit certain classics, which I felt I had an obligation to go to at least once in my life or which have a special place in my heart for personal reasons. Let’s start off with the Bright Star Diner in Central Valley, NY. The first visit to this place a few years ago was born out of the necessity to find something edible on Thanksgiving evening, which is not an easy task. The menu is quite large and the burgers as well as the sandwiches come with crispy fries, coleslaw and some great pickles. All in all, you won’t be dissapointed by either food, service or cost. Is it the world’s greatest or most unusual fare? No, especially not if you are American, but we will surely go there every single time we are in the vicinity and enjoy it as well, for old times sake just as much as for the fact that a really good burger is not easily found in Austria. Our Black Friday breakfast was a quick stop at the Hampton Inn’s included breakfast buffet at 6:00am. Not expecting much, we were surprised to find a huge selection of bagels, English muffins, donuts, cereal, fruit, eggs, bacon, waffles and homefries along with a wide variety of jellies, pb, and cream cheese along with various teas, coffee, and juices. Should you ever find yourself in need of a hotel in Central Valley, New York, the Hampton Inn is the place to go to. Friday lunch was not memorable as the food court at the Shopping Center isn’t one of the great ones. But necessity drove us to eat there. New York City beckoned ad that evening we had dinner at Katz’s Deli. Matzoh ball soup for all, a hot dog with sauerkraut for Birgit and half a pastrami sandwich for me. Meg Ryan seemed to like it (That famous scene in the movie “When Harry Met Sally” was filmed at Katz’s Deli) and while it wasn’t bad, I had hoped for more. Not more food, that is, because portions are generous. The pastrami was good and I am sure I could make a great sandwich with it, I am just not that into a pound of meat between two thin slices of grease-soggy bread. Pickles were great, though. 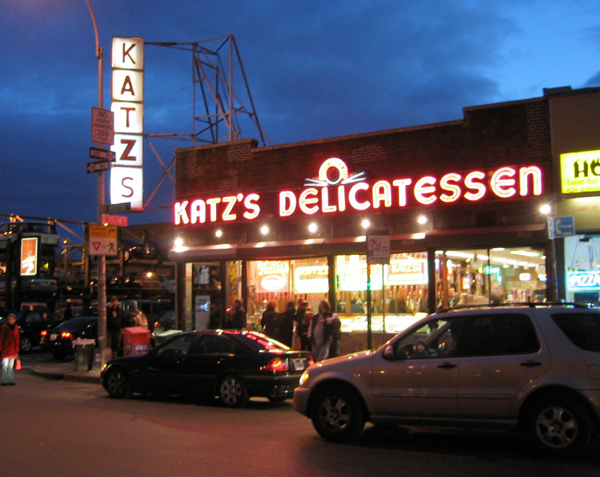 One of the reasons to go to Katz’s was that I hoped to find something to replace Wolfie Cohen’s in Miami. It can’t be done I fear. At least not at Katz’s. On to Carnegie Deli for breakfast on Saturday. I had some Nova lox and a bagel and to my surprise I foud out that a pound of lox and a pound of cream cheese all on one bagel can be eaten. At least by me. For purely scientific reasons, we had to taste the famous house-recipe cheesecake and it was very good indeed. Actually, it was close to perfect. Of course it was way too much and a breakfast for two shouldn’t come to around 70$ but the food was worth it and you only live once after all. As I already mentioned in a comment before, I had a large lobster bisque at the Soup Man (Seinfeld’s Soup Nazi) during the Real Kramer’s Seinfeld tour. I recommend both if you like either lobster bisque or Seinfeld. Saturday night was steak night. I had a filet (9oz plus about 4oz of Birgit’s) plus a baked potato and a house salad with blue cheese dressing on the side. It was one of those “remember the times when we were young and free to do what we want (within a certain budget) ” evenings so, for old time’s sake, it had to take place at the Outback Steakhouse on 3rd Ave. I have had many better steaks in my life (the chocolate-chili filet at Motto’s in Vienna for instance) but old memories made the evening special. Sunday morning, we had breakfast at The National on Madison Avenue, where once again I had to try the lox and bagel – “Twice in a row?” you may ask, but I have had eggs, sausage, toast and homefries too many times in my life and I have worked in an American kitchen long enough, to not particularly crave it any more. I do like a side of bacon though, so naturally I ordered some. It was a mistake – and I didn’t think bacon could ever be a mistake. The bacon was crispy alright and didn’t bother me at breakfast. In retrospect it was a little greasy and slightly undercooked. The last evening of our trip, we went to Shun Lee Palace, an old and top rated Chinese place which is not in Chinatown, but on East 55th Street. Having dinner there is like being in a time warp: suited waiters, silverware in the true sense of being made from silver, and vintage Oscar de la Renta dishes. The meal, which was hot and sour soup, beef hunan style and Chan-Do Chicken was magnificent and the whole evening turned out to be the one we look forward to repeat next time. Of course we could have done Smith and Wollensky’s, Peter Luger’s or Wolfgang’s for steak – or go to Chinatown – or skip Katz’s. We didn’t want to, because the memories associated with a dining experience need not necessarily be “this was the best, the fanciest, or the hardest to get a table at”. Most of the time a decent meal in company of someone special will leave the best memories. 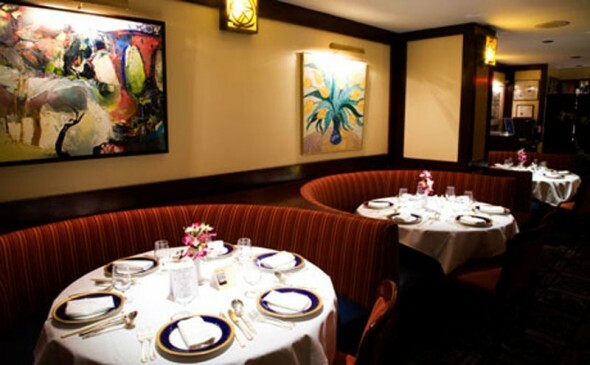 This entry was posted in Ramblings, Shopping and tagged Dining, Food, New York City, Ramblings. Bookmark the permalink. Thanks. I got hungry myself while writing it and reading it today. Maybe I’ll sneak in a snack. It really is a shame, Asali. Katz’s delivers overseas (motto: “send a salami to your boy in the army”). Do I really have to start a war to get some cheesecake over here? Finally the husband shares his gourmand knowledge with us! I love that you went for lox and bagels with such gusto– it was a favorite food of mine growing up. I’ve not had any meat or seafood for about 20 years, but I still dream about those lox once in awhile, but now I satisfy my cravings with just the good bagel, cream cheese and sliced tomato instead. Thanks very much for this Mr O, I loved it! Despite my nearest and deares thinking I’m a fussy eater, I actually adore good food. I never eat better than when I’m in the States or Italy. I dream of a pile of pancakes drenched in maple syrup with crispy bacon and scrambled eggs on the side. Americans are great at making the most simple food taste great, with so many wonderful options. Particularly like the sound of the Bright Star Diner and the Chinese place. As for cheesecake, the New York plain vanilla variety is my favourite. Now, apologies for my ignorance but does lox differ from regular smoked salmon? (Every Friday I have a bagel with smoked salmon and cream cheese so this is very important information!). Tara, I think lox is just a US term for smoked salmon, but Mr O can confirm. As Vanessa has said lox is principally the same thing with some differences in the brining and smoking process. Thanks for the info, Elizabeth. I am sure we will take the boys to Niagara Falls some day and will then swing by Stafford. I keep a list of things to remember for the future and all the info is on there already. Thank you, Elizabeth. I thoroughly enjoyed reading this mouth-watering post by The Husband, whom – somewhat surreally – I just met today for the first time, along with B and their (very sweet) children. I can testify that even in a padded jacket, Mr O is very trim, and exercised considerable restraint at the all-you-can-eat buffet lunch. Highlights of your gourmand weekend for me would be the bagel and cheesecake, the Chinese meal and the steaks. I only eat steak about once a year, but Outback Steakhouse is a favourite haunt – they do everything so nicely, and have cosy booths that are ideal for the lone diner. The last time I had a steak in fact was at one of their restaurants. Thanks, Vanessa. It was very nice to meet you. You are right. I only went for seconds of the main course, so I subconsciously must have restrained myself. I will fire up the grill now to put on some steaks. In the snow. It has to be done. Wolfie’s was great, indeed. It’s a shame that it closed, but thats just how things go, I guess. 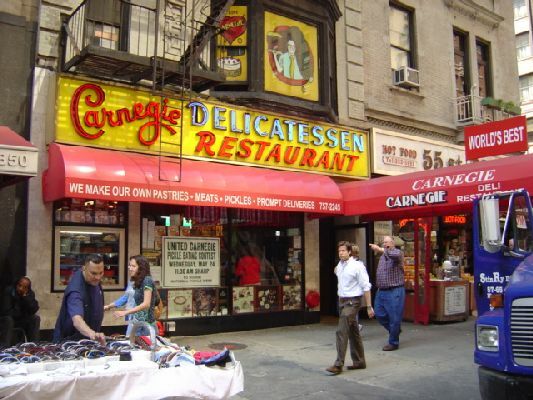 I think one of the reasons why Carnegie Deli cannot replace Wolfie’s is that the typical Wolfie’s customer is a) in Florida over the winter or has b) sadly passed away by now. I enjoyed the NY foodie post! My husband who is always making sure that I don’t forget to eat while I’m on a sniff-a-thon will enjoy it as well! Wow, there’s a crowd near that deli. Scares me. Thanks, Warum. Don’t be scared. 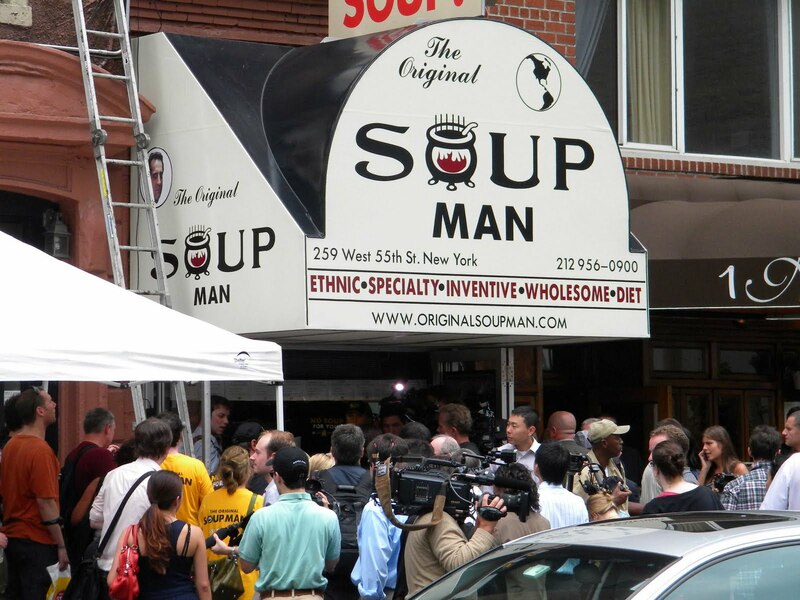 It is a picture of the Soup Man – featured in a Seinfeld episode. The crowd has been served and is gone by now, but the soup is still something every fan should try. After reading your restaurant choices, I’m even more disappointed than ever that I missed you two in New York! I love diner and deli food, and I think that our palette’s would get along just fine. What a pleasure to hear from you on the blog! Perhaps a gastronomical tour of Vienna is in the cards for some future date??? Mr. O, such a fabulous post! You have such a lovely and easy way of describing not only the food, but the reasons for your choices (the sentiment behind these meals). Loved it! And now you’ve made me realize that I have man-tastes in food, because when you said that you ate not only your 9 oz filet of steak, but also 4 oz of Birgit’s, I thought that sounded like just the right amount of steak for myself. 🙂 Well, perhaps not quite that much, but close. (If the steak is good, I actually don’t require much more. Just some asparagus on the side, maybe). Of all the places you described, though, I really want to go to Shun Lee Palace — you make it sound most elegantly retro. Thank you for your kind words, Suzanne. I’ll let you in on a secret: I forced B to order the larger steak for two reasons. One being that I wanted more than 9 oz and because the larger the steak – the smaller the chances that it is overcooked. Elegantly retro is the phrase I was looking for. And it is so much better than hip, chic, or trendy. Mmm, New England Clam Chowder – yummie ! Lady Jane Grey, I know it sounds like a lot, but it was really just breakfast, lunch and dinner. Had I told you about the snacks in between, I would understand your reaction. 😉 And about the Sauerkraut – I can’t even begin to tell you….. It sounds you had lots of fun in NY – I’m looking forward to your next trip and foodie report ! Sounds delicious. I am sure she will love it. Carnige’s and the stage door are much better than Katz deli. The fresh lobster at the Chelsea Market seafood shop is to die for. We spent a week in NYC the last week in June and it was fun revisiting some old haunts and trying a list of new ones. We also made this trip a perfumista oriented one. NYC is fun to visit with your special someone. Glad your trip was a success. Thank you, dremybluz, for mentioning the stagedoor. I just looked up the menu online and will definitely checkit out next time. Chelsea Market is also on my repeat-list since I couldn’t try the lobster. So, it’s not enough that I have to exercise a lot of restraints about perfumes after reading Birgit’s posts… I want to visit most of those places you described! I want to go to NY again. Why wait, Undina? Book now. We only live once and should enjoy every minute of it. But seriously, New York has so much to offer, not only in a culinary sense, that it is always worth a trip. It’s too cold in New York for me now. Maybe in May… Yeah, May sounds about right. But I agree, NY has a lot to offer, it’s one of my favorite cities.